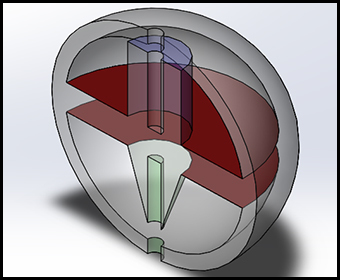 This concept image of the Multistage Polymer Delivery System illustrates a 3-D printed, biodegradable device that allows for a personalized medicine approach to treating a variety of illnesses. Implanted for localized delivery, the device uses specialized geometric shapes to control drug release and dissolves after treatment. (Aug. 7, 2018) — Researchers at The University of Texas at San Antonio (UTSA) and Southwest Research Institute (SwRI) are developing a 3D printed implant that, when injected in a patient’s body, could deliver a personalized dose of medicine to treat infections and ailments such as arthritis, cancer and AIDS. The project, led by Lyle Hood in the UTSA College of Engineering and Albert Zwiener in SwRI’s Chemistry and Chemical Engineering Division, is supported by a $125,000 grant from the organizations’ Connecting through Research Partnerships (Connect) program. For a drug to be effective, patients must take a minimum amount, but not so much that it makes them ill or causes serious harm. Subsequently, someone who needs frequent and precise doses of a specific medicine either has to take a pill each day or visit a doctor for treatment. To remedy this, the San Antonio researchers are developing an implantable device that can deliver a controlled, personalized dose of medicine over several weeks. The design, which Zwiener and Hood created with UTSA graduate research assistant Priya Jain, incorporates complex geometries to personalize each device to an individual’s ailment and takes advantage of the selective timing and release of the compound. The team will create the device with a specialized 3D printer at UTSA that can print biodegradable materials. This makes removal of the implant unnecessary; it will simply dissolve inside the body when the treatment is complete. The implant is also engineered to trigger localized immunotherapy for cancer treatments. Immunotherapy enlists the body to attack cancerous tumors. The UTSA-SwRI team believes that the device’s localized treatment capabilities can trigger the body to destroy the invasive cancer. While the implant is ideal for cancer treatment, it’s designed to be drug agnostic, meaning that it can work with any type of drug and could have a significant impact on a wide array of diseases and ailments. The Connecting through Research Partnerships (Connect) Program, sponsored by the UTSA Office of the Vice President for Research, Economic Development and Knowledge Enterprise (VPREDKE) and the SwRI Executive Office, is a grant opportunity offered to enhance greater scientific collaboration between the two institutions and to increase both UTSA’s and SwRI’s research-funding base with cross-campus collaborative programs.